He was born in 1949 in a Greek village Malo-Yanisol, Donetsk District. Rector of Mariupol State University. Consul Honorary of Republic of Cyprus in Mariupol. Doctor of Political Science, Professor, Corresponding Member of the National Academy of Pedagogical Sciences of Ukraine, Corresponding Member of Parnas Philological Society (Greece) and Academia Peloritana (Italy). Member of the Board of Directors of the European Public Law Organization, Honorary Member of the Board of Directors of the Andreas Papandreou, Presidium Member of the International Association of Law Schools of the CIS, Presidium Member of Scientific-Methodical Commission of Ministry of Education and Science of Ukraine, Member of the Executive Committee for Mariupol City Hall, Chairman of the Committee on Education and Science of Mariupol City Hall, Head Deputy of Federation of Greek Communities of Ukraine. A Famous scientist, an expert in international relations and foreign policy issues, in international integration and development of Greece-Ukraine and Cyprus-Ukraine relations. The author of more than 200 scientific works published in Ukraine, Australia, Greece, Italy, Poland, Cyprus and Russia. Member of the International Editorial Board of the European Organization of Public Law, Editorial Board Member of International Greek-Ukrainian Scientific Journal of Comparative Legal Studies (IJCLS) (edition on Political and Legal Sciences), of collected scientific articles "Gilea (Scientific Journal)" (edition on History, Political Sciences and Philosophy), of "Vestnik MGU" (edition on Philology). 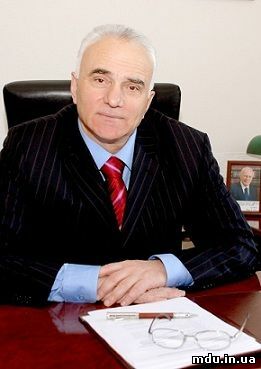 According to the Time Journal (1997), K. V. Balabanov is one of the eight most prominent leaders of the Greek Diaspora who has gained worldwide recognition for his activities in the fields of education, culture and economics. By the Decree of President of Ukraine, he was awarded: Yaroslav the Wise Order of the 5th degree, the Order “For The Merits” of the 1st, 2d and 3d degrees. He is also awarded Prince Volodymyr Order of the Ukrainian Orthodox Church of the 1st and the 2d degrees, the golden K.D.Ushynskiy medal of the National Academy of Pedagogical Sciences of Ukraine. For the great personal contribution into the development of intergovernmental cooperation, he was awarded the Greek Order “Glory and Honor” and the Order of Italian Republic “Star of Italian Solidarity”. He also has an honorable international title “Ambassador of Hellenism”. K.V.Balabanov is an Honorary Citizen of Asklepion City, Greek Republic.